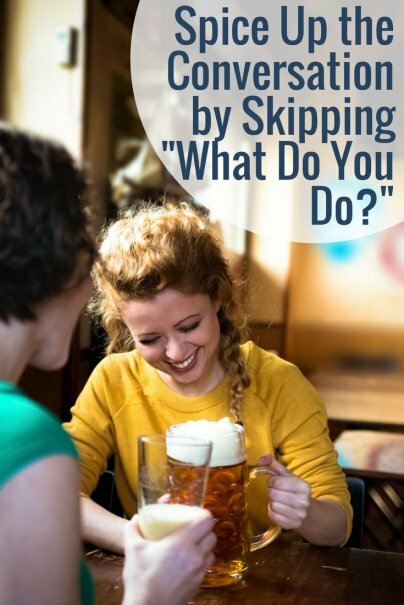 Home » Life Hacks » Spice Up the Conversation by Skipping "What Do You Do?" In an ideal world, we love what we do for a living — and it creates part of our identity. We spend a large portion of our waking lives working at our careers, so it should stand to reason. This is why an easy opening question often surrounds career. But for many people, careers represent little more than conduits to income, and their true identity and passion comes from their activities outside of work. So why not open the conversation with a question that allows somebody to talk about something exciting; something that makes them bubble over with enthusiasm — and which can ultimately lead to new frontiers of conversation? You may wish to choose a different question than "what excites you" (which in some scenarios could even be construed as suggestive). But choose a spicy question or two to have in your coffers for your next meet-and-greet situation; it will surely lead to an interesting exchange. Keep your question open-ended — it's important not to pry. Instead, focus on something that can be answered in many different ways. If you had all the money in the world, what is the first thing you would do? What has been your greatest adventure in life so far? What have you always wanted to do but haven't had a chance to yet? If you could wave a magic wand and do or change anything, what would it be? The point of a spicy question isn't to shock your conversation partner (although often it will surprise them since it's not a "standard" opening question). The idea is to encourage somebody to reveal a passion, dream, experience, or story that they're excited to talk about — which in turn, leads to deeper connections, or at the very least, a conversation you'll both remember. Once you've asked your question, listen to the answer. According to networking principles, what your conversation partner says will lead you to the next question, as long as you're attentive and open-minded. What's your best "spicy question"? Yes, I ask people "what do you like to do?" instead of "what do you do". Much better to get them to open up. Yes, I don't like the "what do you do" question either because it's one of those questions that is innocently insensitive. I've had many friends be asked that question while they were unemployed and be slightly embarrased while answering. I also agree that the correlation between someone's job and who they are doesn't always match up; just because you're an accountant doesn't mean you're boring (for example). What if money was no object, what would you do with your life? Other than money, what else have you gained from your current job? What's the #1 thing you intend to accomplish before you die? I love movies but instead of asking what they're favorite movie is, I ask what the last movie they watched was. Or the last book they read. Sometimes the answer is "embarrassing" (even the biggest film buffs watch dumb movies now and again) which is great! it breaks the ice, gets us into a conversation that can go anywhere, and it builds trust because they get to reveal something about themselves. Usually the "What do you enjoy doing?" works best for me when talking to someone new, but a good one at things like job fairs can be something along the lines of "So give me your spiel." It sets you apart from the crowd by challenging them to make an impression, but it will let the person making the pitch freshen up since they have probably made the same speech 5 times over in the last 10 minutes. Great suggestions for the "spicy" question. I really like how you used "spicy" there too. I received a package from Omaha Steaks as a gift the other day and inside were 5 conversation cards with questions very similar to your "spicy" question. I thought it was a great idea. My roommate had invited a friend over that I had never met before and while my roommate was cutting his hair, I found the cards in the box, opened them up and started asking questions. It worked out quite well. Urgh! What do you do is just an inappropriate question sometimes> what oyu have suggested here are great opening questions so not to start an awkward situation. I had a classmate in business school who would ask "What gets you up in the morning?" instead of "What do you do?" He found it to be more all-encompassing and would often get people talking about their family instead of work. "what do you DO?" in USA is translated in Europe to "what do YOU do..?" and is considered rather invasive, and not polite. With many out of work there (unemployment at around 25% or more) and getting that way here- it's can be an unkind cut to ask such a question. I've never, ever thought to ask a person what they do, it makes me feel as if I am sizing them up. I don't know why or when this habit started, but it's none of anyone's business. It’s a bit flippant, but I often ask "What's your deal?" People usually interpret that as an opportunity to tell me about whatever they are most interested in at the moment. It confuses people sometimes, of course, but adventurous people typically step right up to an open-ended question like that.